Starting Monday, owners of property south of Bonnett Street where sand has drifted west of the dune line will be able to seek the town’s OK to move it back onto the beach with light equipment. The Division of Coastal Management this week approved an amendment to Nags Head’s 2010 Coastal Area Management Act (CAMA) permit for beach nourishment, allowing the town to authorize the use of compact mechanical means, such as bobcats and small loaders and backhoes, to relocate the sand to the eastern side of the dunes. Prevailing northeast winds, plus an unusual number of winter storms this year, have sent sand from the beach-widening project over the dunes. 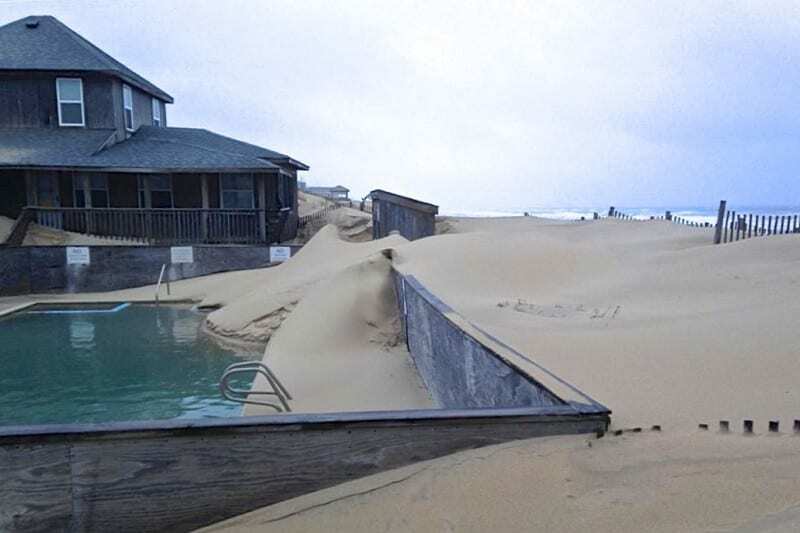 Sand is moving into swimming pools and encroaching on buildings. Property owners will need to complete an application with Nags Head’s Planning and Development Department before moving any sand, according to a statement from the town. Applications will be reviewed on a case-by-case basis. Owners may be required to provide information such as the type of equipment, the route to be used to relocate the sand and how much, if any, vegetation will be disturbed, the statement said. A sketch of the area may also be required. Beach pushing, or bulldozing sand from the wet beach westward, will continue to be prohibited. Contractors relocating sand will need to have their town-issued authorization letter with them at all times. They will be prohibited from creating routes through the dune system but not stopped from crossing over the dunes to take sand back to the beach. Work will be permitted only between 8:30 a.m. and 5 p.m., Monday through Friday between Nov. 16 and April 30. Property owners are asked to call Nags Head’s Planning and Development Department at 252.441.7016 for more information on obtaining a sand relocation permit. Properties outside of the beach nourishment project area, north of Bonnett Street, can take advantage of existing sand relocation methods. More information is available from Nags Head’s Planning and Development Department.